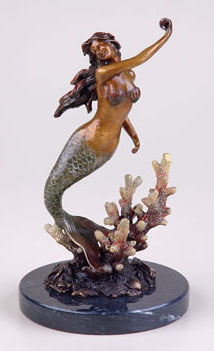 This beautiful Single Mermaid Sculpture is cast using the "lost wax" process. This is the most precise metal casting technique in existence, ensuring accurate reproductions of the original sculpture and exquisite detail. "Lost wax" casting dates back thousands of years. While modern methods and materials have improved the technique, it is still an extremely labor intensive and expensive process. The artwork is created using only the best brass and marble. The detail and craftsmanship is unparalleled. It is finished and detailed to produce an art treasure. It is a staple of contemporary style and elegant taste. It will certainly complement and enhance the beauty of your home or office. Bronze & Marble, 9.5 inches H.
Hurry! Only 6 of this item is left in stock!